I am where I am today only because men and women like Rosanell Eaton refused to accept anything less than a full measure of equality. Their efforts made our country a better place. It is now up to us to continue those efforts. Congress must restore the Voting Rights Act. Our state leaders and legislatures must make it easier - not harder - for more Americans to have their voices heard. Above all, we must exercise our right as citizens to vote, for the truth is that too often we disenfranchise ourselves. President Barack Obama, "President Obama's Letter to the Editor," The New York Times Magazine, August 12, 2015. http://www.nytimes.com/2015/08/16/magazine/president-obamas-letter-to-the-editor.html. 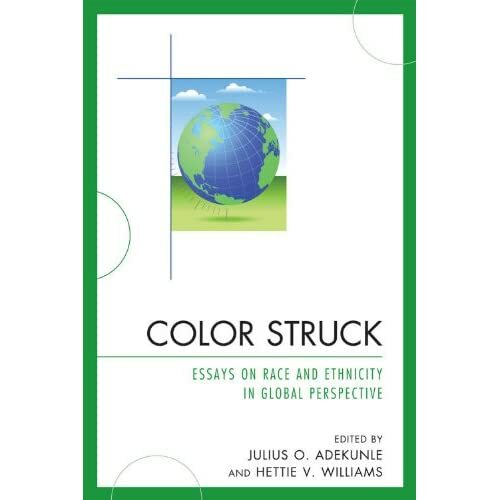 Color Struck: Essays of Race and Ethnicity in Global Perspective is a compilation of expositions on race and ethnicity, written from multiple disciplinary approaches including history, sociology, women’s studies, and anthropology. This book is organized around a topical, chronological framework and is divided into three sections, beginning with the earliest times to the contemporary world. The term “race” has nearly become synonymous with the word “ethnicity,” given the most recent findings in the study of human genetics that have led to the mapping of human DNA. Color Struck attempts to answer questions and provide scholarly insight into issues related to race and ethnicity. This entry was posted	on Sunday, October 24th, 2010 at 14:10Z	and is filed under Africa, Anthologies, Anthropology, Asian Diaspora, Books, Brazil, History, Identity Development/Psychology, Media Archive, Politics/Public Policy, Religion, Slavery, Social Science. You can follow any responses to this entry through the RSS 2.0 feed. You can skip to the end and leave a response. Pinging is currently not allowed.